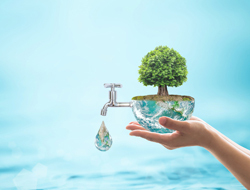 Going green: A vegetarian diet to save water - Healthcare Asia Daily News | Asia's Leading News and Information Source on Healthcare and Medical Industry, Medical Technology, Healthcare Business and R&D, Healthcare Events. Online since 2010. : Healthcare Asia Daily News | Asia's Leading News and Information Source on Healthcare and Medical Industry, Medical Technology, Healthcare Business and R&D, Healthcare Events. Online since 2010. According to a new study, becoming vegetarian has a huge impact on water savings.By cutting down on meat an individual can save about 10%, and up 55% by getting on an altogether healthier diet. Shifting to a healthy diet is a “win-win situation”, say researchers.Citizens will be healthier and their food can be produced using less water. “The main message is that if you shift to a healthy diet, be it with meat or without (vegetarian or pescetarian), according to your own preference, it’s not only good for your health, but it’s also very good for the environment in the sense that you reduce your water footprint substantially,” says Dr. Davy Vanham of the European Commission’s Joint Research Centre, in Ispra, Italy. The study suggests that the water footprint from food consumption (domestic and imported food) per person per day is 2,757 litres in the UK, compared with 2,929 for Germany and 3,861 for France. Switching to a healthy diet with meat would reduce water consumption by 11-35%. A healthy pescetarian diet reduces water consumption by 33-35%, while a vegetarian diet reduces water consumption by 35-55%. Freshwater resources are already scarce, but the problem is set to get worse, due to population growth, changing lifestyles and climate change. Multiple public service announcements air over radio waves, televisions, and billboards on saving water by taking shorter showers and turning of taps while brushing teeth. Yet there is insufficient awareness surrounding the amount of water used to produce food. Raising livestock expends a lot of water. Oils, sugars, and fats also require large amounts of water to produce, but growing fruits and vegetables is more water efficient. The results were very similar in the three countries, confirming that people in Europe tend to eat too much red meat, sugar, and fat, but do not eat enough fruit and vegetables, he said. The research, carried out in the UK, France, and Germany, is published in the journal, Nature Sustainability. It is based on analysis of food-related water consumption for current and recommended diets, down to the level of individual boroughs. It is currently the most detailed study of its kind.